Researchers monitored a major “current” (it is not strictly a current, but let’s call it that for sake of ease) called the Atlantic Meridional Overturning Circulation (AMOC), as it flowed through the Florida Straits from 2004 onward. Generally, they observed very little variation of flow during that period (17.6 to 19.9 sverdrups; 1 sverdrup is equivalent to the flow of 1 million cubic metres per second). In 2009/2010, however, they showed that this flow of water decreased substantially to 13 sverdrups, a drop of 30%. They then wanted to see if this reduction in the flow of the AMOC had any effects on the temperature of the ocean — potentially explaining the unusual weather conditions over northwestern Europe that year. They used a network of temperature sensors in the ocean to look at the heat content of the North Atlantic Ocean, north and south of 25oN since 2004*. North of this latitude there was a sharp drop in heat content in 2009/1010; south of this latitude, the heat content of the ocean had increased (see image below). All of this provides fairly convincing evidence that the abnormally cold winters of 2009/2010 and 2010/2011 experienced in northern Europe, and the increased temperatures felt in the tropics (which likely contributed to the third most active hurricane season on record in 2010), were the result of a slow-down of this “current” bringing warm water to northerly latitudes. Until now, changes in wind patterns were thought to be the main reason for this. the slowdown in the AMOC. From Brydon et al. (2014). Although the authors have little idea for why this slowdown of the AMOC happened, it does perhaps provide an insight into what conditions may be like if this circulation slowed down as a result of increased arctic melt-water, a scenario that has long been feared by scientists for some time now, and one that has received much attention in the popular press and in movies such as The Day After Tomorrow. 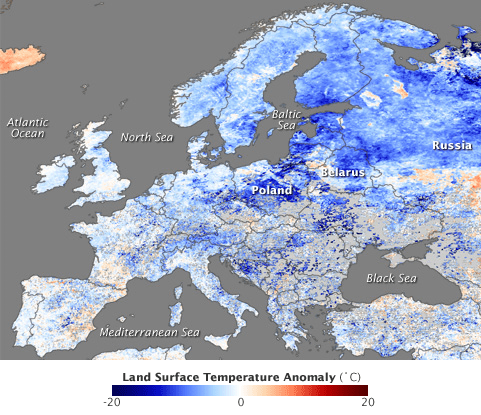 It is suggested that this circulation may slow by up to 34 % (under worst case emission scenarios in the latest IPCC report) by the end of the century, and if that happens, the anomalous weather observed during this period may become a permanent feature of Europe’s climate. *The heat content was found to be generally higher since 2004 than it has been in the past, supporting recent observations that much of the excess heat in the atmosphere from climate change is being taken up by the oceans. 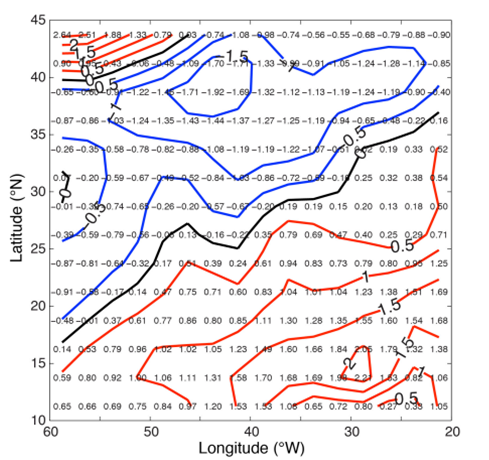 Impact of a 30 % reduction in Atlantic meridional overturning during 2009–2010. A current is a horizontal flow of water. I guess the AMOC would not strictly be considered a current as it refers to the whole “conveyor belt” of water flowing from the surface ocean to the deep ocean and then back again. I have heard of AMOC before but never understood what it was. Thanks for that guys. Lets hope that what happens in The Day After Tomorrow never happens.